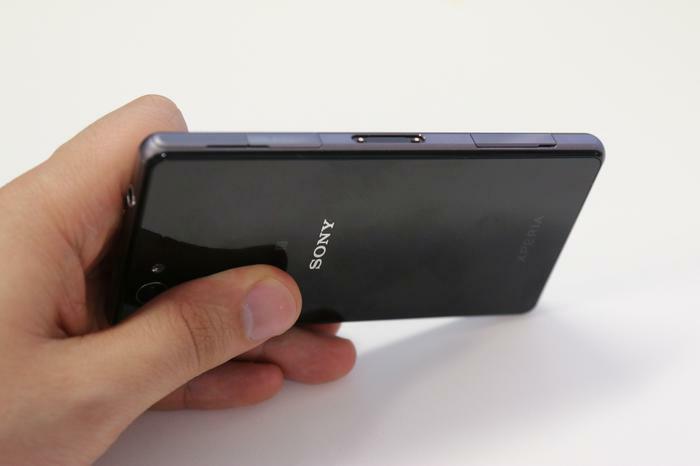 Sony's 4.3in Android smartphone takes it to the established Apple iPhone 5S. Customers no longer have to choose between an iPhone or a big Android device following the release of Sony's 4.3in Xperia Z1 Compact. The smartphone bundles performance innards with a 20.7MP camera and waterproof credentials, but will this be enough to sway customers interested in Apple's iPhone? The Z1 Compact and the iPhone 5S might hover around the same size, but the designs of the two smartphones couldn’t be more different. Sony has tried to give the Z1 Compact an understated elegance by keeping the smartphone simplistic. Its flat front and back are free from imperfections, and the look of light shimmering on its uninterrupted face looks sublime. Unfortunately this look is spoiled by the many waterproof flaps on its left side, and the dense arrangement of ports undermines the Z1 Compact’s overall appeal. It's a case of function overruling style, and as a result, the smartphone has to rely on its features if it's going to establish any kind of emotional connection. Then there’s the Apple iPhone 5S, idly laying on the desk with nothing but elegant curves, premium materials and the marks of exquisite craftsmanship. 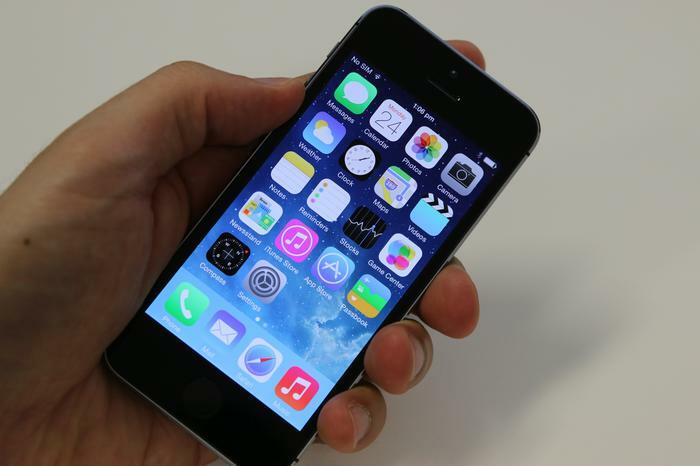 Whereas the Z1 Compact looks functional, the design of the iPhone 5S has been dictated by beautiful simplicity. Beauty stems from an almost-obsessive attention to detail. Pick the smartphone up and you'll notice crystalline-diamond cut edging. Then there's the machine drilled speakers and the bespoke 'profile' switch. Its front and back are flat too, but kind curved corners add charm to the 5S. 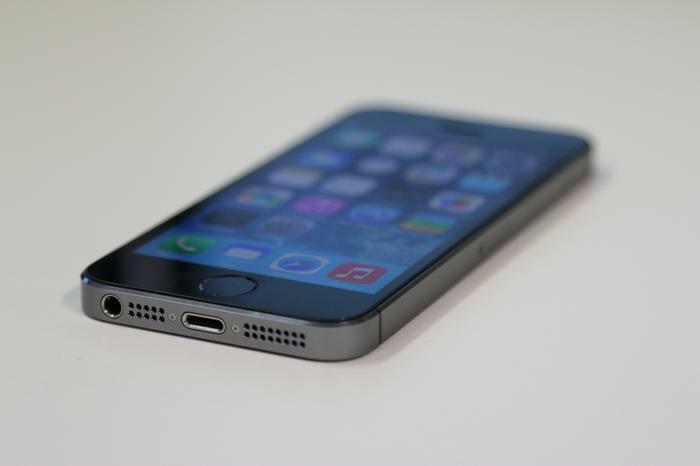 Apple’s smartphone is also noticeably smaller, and this makes it less intrusive. 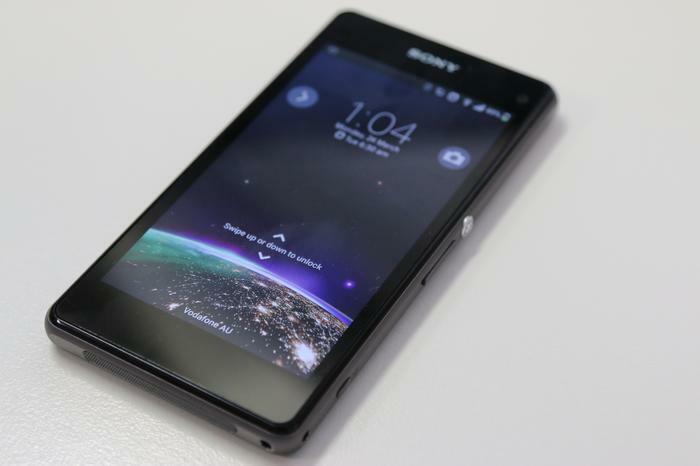 A point of difference between the Sony Xperia Z1 and Apple’s iPhone 5S is the software. The Z1 Compact uses Google’s Android, while Apple continues to rely on its own iOS. The two operating systems might be developed by different companies, but picking between them boils down to a matter of preference. Both operating systems are incredibly functional, benefit from extensive application support, make use of familiar gestures and are beautiful to use. 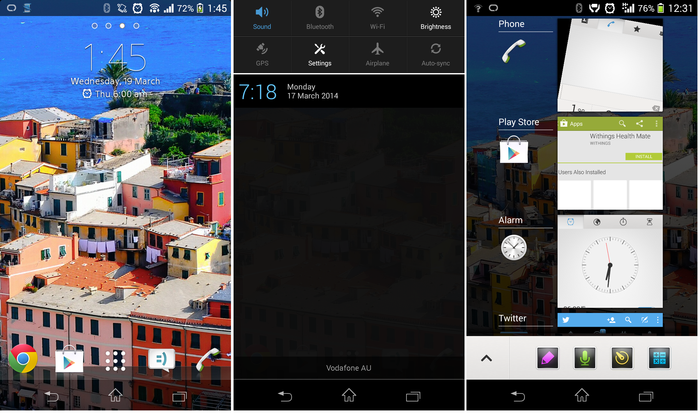 Sony adds a custom overlay that complements the Android 4.3 Jelly Bean software extremely well. Noticeable additions include apps that position the Z1 Compact at the heart of Sony home entertainment systems. The Z1 Compact displays a level of intuition by launching relevant actions automatically. 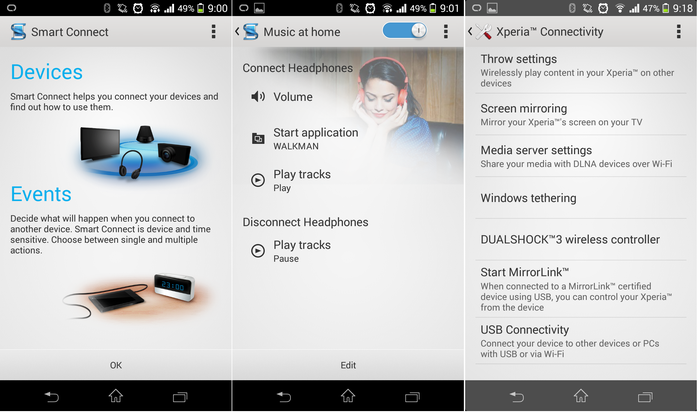 For example, music automatically resumes when you plug in headphones, or when the smartphone is recognised by a home audio system. Furthermore, the display on the smartphone can be ‘mirrored’ on televisions and other displays compatible with the Miracast standard. Owning Sony televisions and sound systems isn’t necessary for these features to work; however, there are benefits to having other Sony products in your ecosystem. Setting all of the devices to communicate with one another will be easier, and will using it with your PlayStation. Sony gains access to Google’s rich ecosystem by using the Android operating system. A simple gmail account acts as a skeleton key that backs up your contacts, calendar, applications, browser and Google’s range of content services. This means the vast range of information on your phone is backed up and can be easily transferred to other Android accounts. The Xperia Z1 ships with Android 4.3 Jelly Bean, but Sony has pledged an update to the latest 4.4 KitKat will be made available. Sony might appropriate the Android software well, but Apple tailor its software from the ground up to suit the iPhone’s hardware. 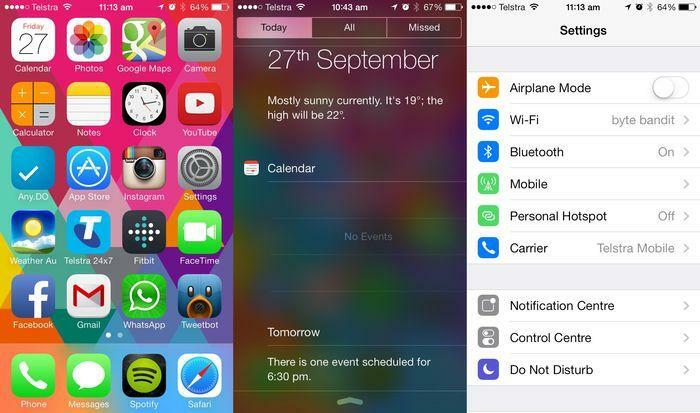 The interface is undeniably beautiful, with its seamless transitions and the colourful persona of iOS 7. Apple restricts how you manage personal and multimedia content on the iPhone. iTunes is used to update the iPhone’s software, backup personal information and synchronise eBooks, photos, music, movies and applications. Many people will find iTunes streamlines how you use an iPhone, but others will find its restrictions limiting and dictatorial because there is no alternative. Carefully controlling each aspect of the ecosystem has also streamlined how an iPhone interacts with other Apple devices, including the company’s computers, tablets, Apple TV, and compatible AirPlay speakers. Setting the standard has put Apple in the unique position of having a very strong product ecosystem, to the result other companies rely on the iPhone to deliver their products and services. Winner: Draw. Both operating systems deliver the same extensive range of features.